One in six of all deaths on Britain's roads are alcohol-related. This means that, in this country, approximately 11 people are killed each week by drunk drivers. Despite high-profile government campaigns targeting drivers, and ever harsher penalties imposed on those who drink before driving, thousands of people continue to flout the law, putting their, and the lives of others, at grave risk. Alcohol is a depressant: Not in the sense that it makes people sad (though it does also act as a mood enhancer), but in that it depresses nerve reactions, physical and mental responses, and judgement. Simply put, alcohol slows down both the mind and the body, and their combined ability to anticipate events. Therefore, if you are engaged in a relatively slow, simple activity, such as walking, the effect of a moderate amount of alcohol will be minimal. However, when we drive, we require a far faster, more complex set of reactions and coordination. Even if you are an experienced driver, you are relying on hundreds of small, coordinated reactions: Checking mirrors and distance; operating acceleration and braking; compensating for differing light and weather conditions. All of these activities are taking place while moving at a far higher speed than the human body was originally intended to travel. For this reason, even a moderate amount of alcohol can be enough to interfere with your reaction times, and cause a potentially fatal accident. It can be difficult to figure out exactly how much alcohol can put you over the legal limit. Government sources have traditionally been unwilling to detail the information, out of fear that people will try to drink exactly up to their limit before driving. However, the arguments against this viewpoint are strong. Firstly, it can be argued that protecting people through ignorance is no protection at all: Not knowing what the legal limit is could potentially do far more harm than good. Secondly, and perhaps more importantly, it can be valuable for a driver's friends and family to know just what the legal limits are, so that they can ensure he or she stays safe, and on the right side of the law. The UK drink-drive limit is 80mg of alcohol per 100ml of blood. But what does this mean? The 80mg figure translates into a total of four units of alcohol for men, and three units for women. By way of an example, a single shot of spirits, at 40% alcohol by volume (ABV), contains one unit of alcohol. One pint of beer, at 5% ABV, contains 2.8 units.A large (175ml) glass of wine, at 12% ABV, contains 2.1 units. This means that after two pints of strong lager, or two glasses of average-strength wine, a driver would be over the legal limit. If a driver is found to be above the legal limit mentioned, he or she can be jailed for up to six months, be fined up to £5,000, and be disqualified from driving for up to a year. In most cases, disqualification is automatic, meaning that even if you are just marginally over the limit, you will still lose your driving privileges for 12 months. In the worst-case scenario - causing death by driving under the influence of alcohol - the offender can receive a maximum sentence of 14 years in prison, an unlimited fine, and an automatic two-year driving ban. 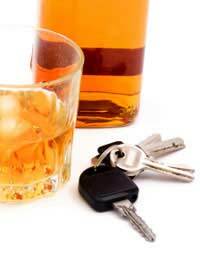 If you are a driver, the truth is that the safest amount of alcohol in your bloodstream is zero milligrams. And if you enjoy drinking too much to resist temptation, leave your car at home. If you and your friends regularly go out for a drink, consider rotating a “designated driver” - and keep him or her on the orange juice or coffee! And if it's a special occasion, share a taxi. Just remember: Anything is better than a fine, a prison sentence – or the risk of taking a life. 'The UK drink-drive limit is 80mg of alcohol per 100ml of blood.' This is no longer true with regard to Scotland. On December 5th 2014 the alcohol limit for drivers in Scotland reduced from 80mg to 50mg of alcohol in every 100ml of blood, bringing it into line with most other European countries. Please can you update the website to reflect this.